UPDATED: Wed., Aug. 8, 2018, 4:01 p.m. Calling her a seamstress is an understatement. Technical sewing specialist is more accurate. “Outdoor gear angel” is a perfect fit. Penny Schwyn has been modifying and repairing used and abused parkas, tents, packs and other outdoor stuff in her Spokane home for more than 35 years. Her business, Specialty Outdoors, is factory authorized for repairs by The North Face, Helly Hansen, Descente and TREW Gear, although she deals with any brand. She got the itch to stitch at the age of 7 and was the Jill of all trades for Colorado-based Mountainsmith pack company in the early 1980s before moving to Spokane with her husband Craig. After working for a local custom sewing shop, she eventually carved out her niche as the gear lady. Outdoors people “are a lot less stressed-out than brides, but they’re just as demanding about their clothing,” Schwyn said in a 1997 newspaper interview. Most of her work nowadays involves making new gear fit the person or the job and adding life to expensive stuff that’s been tattered through serious adventures. “Newer ultralight stuff wears out faster than classic gear because, well, it’s ultralight,” she said. Zipper repairs come in regularly to her weekly pick-up station at the Mountain Gear retail store. She diagnoses the problem – dirt and sand can wear them out prematurely – and then either replaces the worn out sliders (cheap) or installs a new zipper regardless of whether it’s straight, curved or waterproof. Say you got a great deal on alpine skiing bibs and jacket, but they’re too long in the legs or arms – Schwyn can make them fit. That pack strap that’s pulling loose from a seam can be repaired and probably improved. Got too close to the campfire with that expensive puffy down jacket? She can fix everything from spark holes to meltdowns, and often match the fabric. Schwyn’s had plenty of experience repairing mosquito netting in tent doors that failed to hold back the pet dog, say, from chasing a squirrel. Active at mountain biking, skiing, camping and whitewater rafting with her family – and repairing the damage they do – Schwyn has insights into common gear woes. “Washing technical fabrics can increase their life by removing dirt that wears them out,” she said. If climbers say they need reinforcements in their pant legs where their crampons keep ripping holes, she knows what they’re talking about. “Some people love their gear to death,” she said, noting that a certain pack or parka might be the most comfortable or fulfilling product they own, or maybe it’s simply linked to fond memories. “I see a lot of edge slices on ski wear, or rips from branches after they ski the trees,” she said. Motorcyclists’ outer wear needs mending from crashes or contact with hot mufflers. 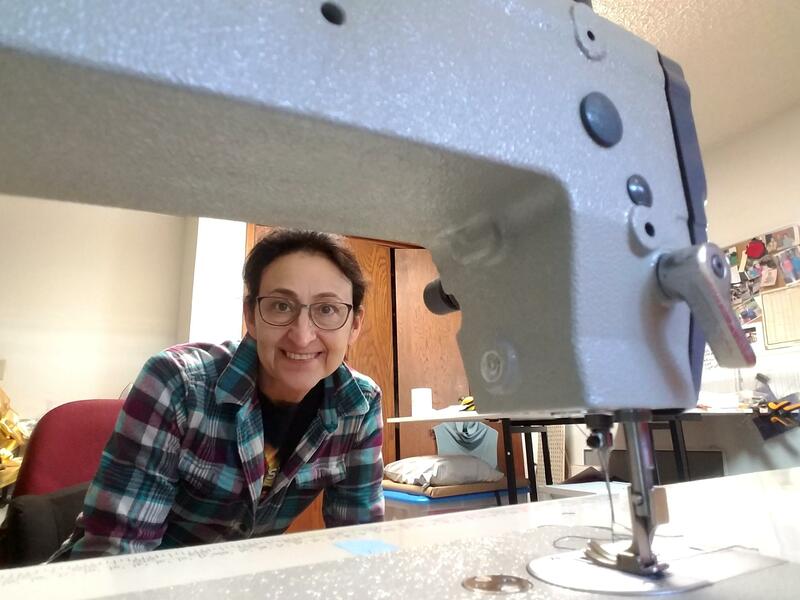 Primary tools of her trade include single-edge razor blades, pins, a sewing awl, top-quality sharp scissors and her workhorse artisan needle-feed industrial sewing machine. She fixes a lot of Gore-Tex apparel since the waterproof-breathable fabric is too expensive to discard after a little abuse. “I upgraded five years ago to a factory seam-sealing press, which makes my job a lot easier and gives really professional results,” she said. When patching a shell jacket, Schwyn doesn’t sew through all the layers of the coat and call it good. She opens the coat, patches the outer layer, seals the repair and closes the coat at the seam using appropriate threads and bar tacks. She’s eased out of most custom work. “It’s very time-consuming and most people don’t want to pay for the amount of time it takes,” she said. Schwyn’s minimum charge is $15 and her shop rate is $60 an hour. Pricing guidelines for everything from replacing Velcro to modifying protective skydiving togs is on the Specialty Outdoors website. Recently she repaired a decades-old Gerry sleeping bag, replaced a zipper on a classic Early Winters toiletries travel kit and added a front zipper to a hunter’s new camouflage hoodie pullover. The garment was made of noise-free, water-shedding technical fabrics but lacked a way to ventilate heat during exertion. Schwyn occasionally turns away repairs and advises customers to save their money. “Once in a while I need to tell people very tactfully that they have to throw something away,” she said, holding up threadbare Patagonia pants that were falling apart from years of use. With a little care, good outdoor gear will last for years, she said. But accidents happen. That’s when Penny can come to the rescue. Published: Aug. 3, 2018, 5 a.m. Updated: Aug. 8, 2018, 4:01 p.m.